Three men were taken to local hospitals with minor injuries after a portion of the Concord Music Hall's ceiling collapsed. CHICAGO — Three men were taken to local hospitals after part of a Logan Square nightclub's ceiling fell early Saturday morning, and city officials say vibrations from the music likely caused the damage. A two-by-three section of plaster fell on the crowd while DJ Datsik, a dubstep DJ famous for his bass heavy production, performed his set at the Concord Music Hall, 2047 N. Milwaukee Ave. That same heavy bass likely caused the ceiling to fall, a structural engineer hired by the venue determined. "The structural engineer's preliminary investigation suggests that vibrations from the music contributed to the failure," said Mimi Simon, a Buildings Department spokeswoman. Cellphone footage shows a small amount debris falling from the ceiling as the bass hits. Seconds later a large chunk of the ceiling is dislodged unleashing a large amount of debris along with parts of the ceiling. The concert was canceled shortly after. 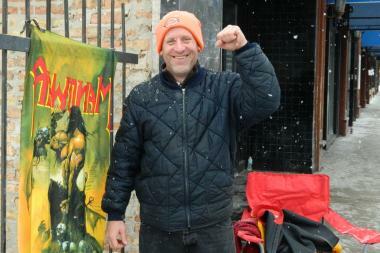 Tim Burgin, 47, of Lincoln Square was prepared to stand in line for the Manowar concert for hours even if they were unsure if the concert would happen. Around 1:20 a.m., three men were hospitalized after a piece of the third-floor ceiling fell striking them in the upper body, said Officer Jose Estrada, a police spokesman. A 25-year-old and 20-year-old man were taken to St. Mary's Hospital with minor injuries. A 31-year-old man was taken to Stroger Hospital with minor injuries also. All three of the injuries were non-life threatening, said Estrada. "Chicago I am sincerely sorry the roof collapsed tonight. We had fun while is lasted and I promise we are coming back bigger and badder," wrote Datsik on Twitter. "Im happy no one was seriously injured. I love u guys and can't wait to come back and do it proper." 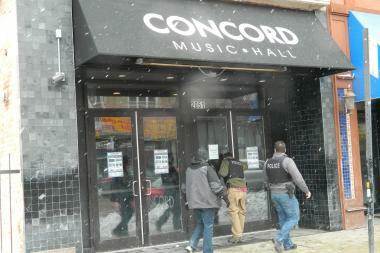 "Concord Music Hall has voluntarily agreed to close until further notice due to a section of plaster falling from its ceiling during a show last night. During this time, Concord will fully cooperate with all City of Chicago officials to ensure that there are no ongoing concerns for the safety of its patrons and its employees." The venue will remain closed until it can pass a city inspection, Simon said. Representatives from the venue said they would release news about future events later in the day. Metal band MANOWAR was scheduled to play a concert Saturday night; the show was moved to the Logan Square Auditorium, the band said on Twitter. That's good news for Tim Burgin, 47, who set up shop in front of the Concord as a light snow collected on his lawn chair Saturday afternoon. "Until I hear it from the band on Twitter. I don't move," said Burgin, a Lincoln Square resident. "I'm staying here until I hear otherwise. I got no problem standing in the snow for hours to see these guys."